Scottish viewers largely believed that Brown’s former chancellor Alistair Darling, and the head of the anti-independence ‘Better Together’ campaign won the first televised debate against Scottish first minister Alex Salmond, the leader of the ‘Yes’ campaign and the head of the Scottish National Party (SNP). But the two will meet again on August 25, and polls show that while the ‘No’ side holds a double-digit lead, the ‘Yes’ side has made small gains as the referendum campaign enters its final and most intense month. According to the latest YouGov opinion poll, the ‘No’ vote would win a referendum if it were held today by a margin of 57% to 43%. Though it’s a wide lead, there’s no precedent for the September independence referendum. Viewed another way, it means that a 7% swing toward independence would make the vote a toss-up. It’s not the SNP’s nationalist voters, however, that will decide Scotland’s fate, nor is it the unionists, pooled within the reservoirs of Scottish Tories and Liberals, along the English border and on the Orkney and Shetland Islands. Scotland’s swing voters are concentrated, instead, among two groups. The first are the 16-, 17- and 18-year-olds who will be casting their first ballots for perhaps the most consequential political decision of their lives. The second group are rank-and-file Scottish Labour voters. Enter Brown, who re-emerged this summer with another lengthy work, My Scotland, Our Britain: A Future Worth Sharing. Throughout the spring and summer, Darling and the ‘Better Together’ campaign sustained wide criticism. One moment, Darling and the ‘No’ side were accused of scare tactics, the next minute they was too unfocused and lackluster. But it’s the nature of those things that the proponents of change wield greater passion and focus. Darling and Brown are defending the status quo, imperfect as it may be; Salmond and the SNP can paint a rosy portrait of a vibrant pseudo-Nordic social welfare paradise on the blank canvas of the unknown. 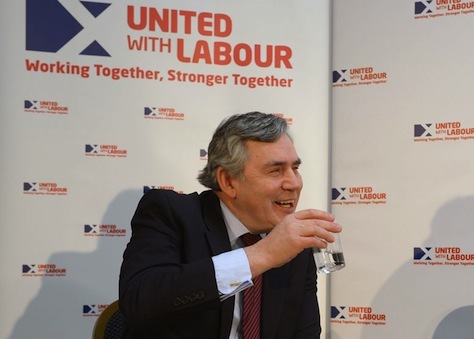 Nevertheless, Brown’s quiet campaign — not entirely welcomed by Darling and the official ‘Better Together’ team — is proving a welcome addition to the case for union. It’s easy to forget that the globe-trotting Blair, with his transatlantic accent, was born in Edinburgh. In contrast, throughout his time in Westminster, Brown wore his Scottishness as naturally as his intellectual and brooding character. That’s one of the reasons why he’s such an effective advocate for the British union today. Brown argues that the impetus for the Scottish independence movement comes from the upheaval and uncertainties of globalization and the decline of working-class industrial jobs throughout Scotland. He adds, with some credibility, that the decline of longtime Scottish institutions, like the Presbyterian Church of Scotland, have left a gap that political nationalism is filling. But there are other equally strong explanations. The independence debate follows naturally from the Blair-Brown government’s decision in 1997 to introduce devolution and pave the way for a Scottish parliament. It’s not a coincidence that the SNP’s initial rise in the 1970s and 1980s came in tandem with the promise of North Sea offshore oil, giving Scotland an economic basis for independence. The 11-year government of Conservative prime minister Margaret Thatcher, increasingly alienated Scottish voters, especially when she decided to use Scotland as the testing ground for the much maligned poll tax. ‘No’ advocates have menacingly threatened that an independent Scotland will be forced to reapply for membership in the European Union. But it’s European integration, more than anything, that has fueled independent Scotland’s plausibility. With the penumbra of a European regulatory superstate, relatively more pro-European Scots might find that they have a greater chance of remaining EU members as an independent country if Nigel Farage and eurosceptic populists win a promised 2017 referendum on exiting the European Union. Brown has cogent answers for all of these, of course. He argues that further devolution — ‘devo max’ — for Scotland is inevitable if it remains part of Great Britain. He notes that the promise of national healthcare and education is a British compact, not a European one. He cautions that future North Sea oil revenues aren’t nearly as optimistic as Salmond and ‘Yes’ proponents claims. Much of this is down to the well-worn observation that Brown retains a standing in Scotland he never really had in England. North of the border he is seen as a national heavyweight, the last of a leadership class that included the late Donald Dewar, John Smith and Robin Cook, and is therefore automatically granted a hearing…. The way Brown describes it, the union is no longer an imperial hangover that represses Scotland but a neat set-up for distinct and proud nations to club together, sharing resources and pooling risks. That arrangement has served Scotland rather well: why on earth would you throw it all away? The nationalists have an answer, of course they do. But Brown’s version makes it a much harder question. Now other no campaigners are following his lead, adopting the frame he constructed. No one should count on the ‘No’ campaign’s long-held polling lead as evidence that Scottish independence is doomed. Advocates on both sides are presenting mostly thoughtful arguments in a textbook example of participatory democracy at its finest. But both ‘Yes’ and ‘No’ proponents will agree that Brown has made a worthwhile contribution, and that, however Scottish voters decide next month, his personal campaign for unionism will bear positively on his legacy.